and this is my gaming blog, but I suppose that part was pretty obvious. Well, what started out as a personal blog has become more and more about gaming, so I decided to just give in to it. I suppose it’s because gaming what I spend most of my time thinking about. I run a lot of roleplaying games – for friends and at game conventions, mostly in the New England area. Primarily I run old school D&D, using my pal Delta’s OED variant, but I also dabble in some games of cosmic horror. I also collect a lot of board games, and am especially addicted to anything dungeon crawl related. By day I’m a video game developer with Disruptor Beam, creating awesome games like Star Trek Timelines. You may have seen me on panels at PAX East or Star Trek Las Vegas. 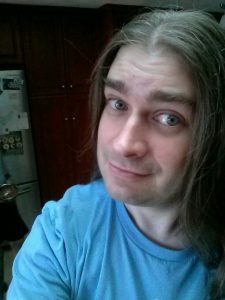 I also occasionally spend some of my free time working on my own indie game projects, or cooking up some software to feed into that first habit I mentioned – running roleplaying games. Some of the latter can be found in the Tools section of this site. So feel free to drop me a line, or better yet, post some comments on one of my posts. I’m always happy to spend a little more time chatting about games.